I don’t get along with Blue Shells. 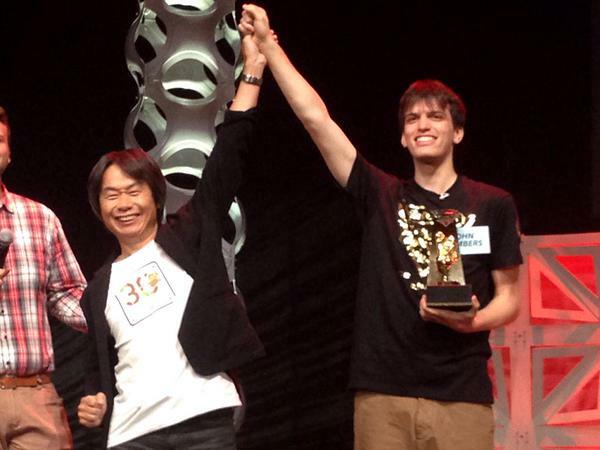 you just made miyamoto even more precious. I guess Kade didn’t know that it’s generally possible (though in most games, tricky) to evade the dreaded Blue Shell (of Death). Everytime a Blue Shell comes after me I have a coin for a weapon and no one on my heels to take the blow. Friggin’ worthless coins. One of my least favourite features from the original game comes back. Should’ve hung on to that Super Horn. That awkward moment when you look behind you and realize that you’re screwed. That feeling of being “this close” to victory, and having some troll at the back use a superweapon _just_ to screw you over. Does anyone here have a Favorite person in Mario Kart 8? Well, Nicole, you could always take Kade skydiving, Pilotwings style, to make up for it. I think there’s a place in the LA area; it’s just a plane ride up and a heck of a long fall down. Also, is there a given name for the victorious cat? OH wait… Now that I think about it that’s just John Numbers in cat form. Cool. Oh, that was fanaminal. I just added that video to my favorites list. Wait, if the winners are wearing clothes, does that make everyone else naked? Ya gotta dress for success! That’s a nice Zelda motorcycle. On the bright side, this just means more practice on mario Kart cause I really hate those blue shells. (Especially when my siblings use it -w-) Is that Mario on the trophy? Yea the bike is epic how long did that take? Oh that evil thing. The blue shell is the heartless assassin of Mario Kart. It doesn’t care how hard you worked to get to first or how much you sacrificed. It will find you and it will end you. such terrible luck, but at least Kade gets to go home with a shirt and knowing he did great(though I wonder if Kade will ever wear the shirt >~>). also loved the idea with the tanooki Miyamoto. Kick the * out of your friends. Have a blast as you kick their * and they’re forced to clap for you in the end. Who the **** threw that blue shell? I will **** you up! A blue shell…… really? I thought you had skills man. Kade goes on first place without a mushroom to dodge that thing?! Oh. My. Gannondorf. HYLIAN MOTORCYCLE!